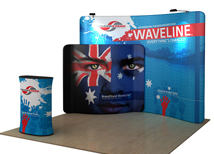 Waveline displays are some of the most affordable display systems available. They use a full dye sub fabric graphic that fits over a tubular aluminum frame like a pillow case. There is an industrial strength zipper which closes the graphic and creates tension on the system. 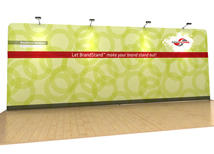 The full color graphic allows you to place anything on the display to create a stunning graphic backdrop. 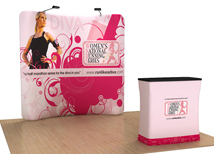 There are many sizes available so you can find a display that will fit your booth space perfectly. 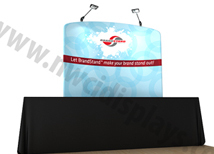 We also carry many other products from Brandstand including OneFabric Displays and hanging banners. 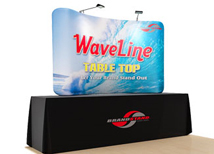 Waveline displays have many advantages over standard pop up displays because they have no easy to break parts and are very affordable. 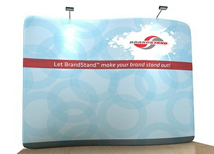 Brandstand is the manufacturer of this great trade show display and we carry many other products from them. The full proof design of the frame has virtually no easy to break parts and is designed to last a lifetime. 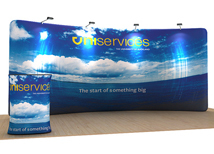 There are also many banner stands and trade show counters that can be used with this product to create a great booth display. 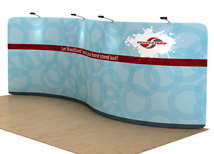 Waveline displays are becoming increasingly popular for companies looking to market a product at a lower cost. 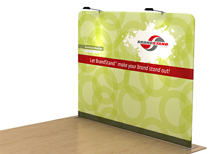 The Waveline display is a great option because it is a quality product that looks very clean on the trade show floor. 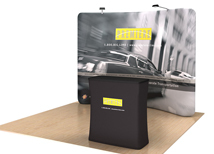 Our entire line of portable trade show flooring works great with the Waveline in any size. 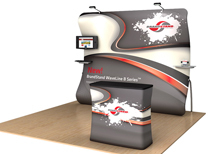 We also carry trade show displays that can support monitors and custom features!